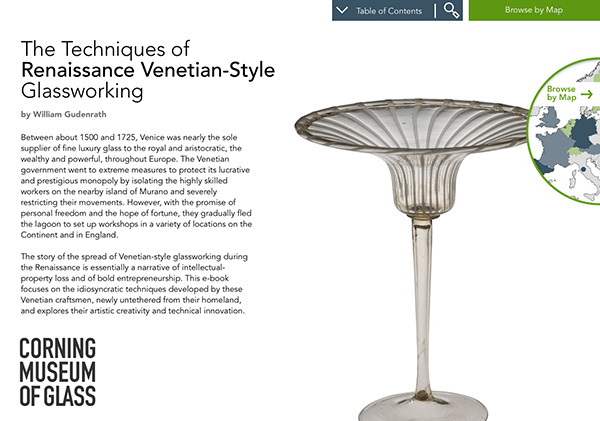 An exceptionally elegant vessel, this wineglass is a perfect example of an object built on the blowpipe. It has a stem with no constriction, and it features a merese and an exaggerated flare at the opening. 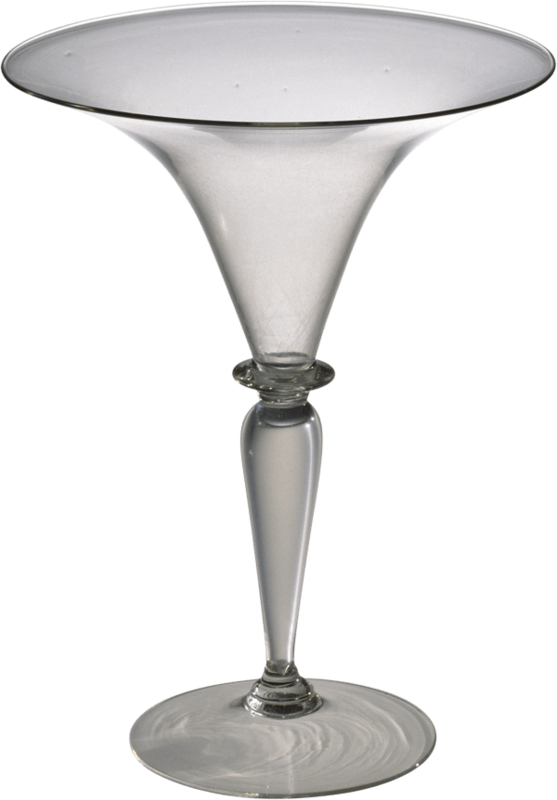 This exceptionally elegant glass is a perfect example of an object built on the blowpipe. So the first gather will become the cup of the vessel. The glass is gently rolled back and forth on the metal table called the marver. This makes the gather slightly tapered, elongated, and perfectly concentric with the blowpipe. Air is blown in, and the bubble forms. The tip is rolled on the marver to make it pointed and to cool the tip of the gather. The tip is further cooled, and the blowing and shaping begins to create the nascent form of the cup. The rubber tube allows air to be blown into the pipe while work is done with the two-bladed tool called the metal jacks. A constriction is formed between the bubble and the blowpipe, and later in the process, this will allow the glass to be broken free of the blowpipe. The lower part of the oblate spheroid is reheated. The tip is pulled to form the lower shape of the vessel. The glass is very thin, cools quickly, and must be reheated frequently. The end of the bubble is trimmed, excess glass knocked off, and the tip of the bubble is reheated to make it perfectly flat. A small gather of glass is made on the end of a narrow metal rod, attached to the tip of the bubble, cast free of its gathering rod, and a merese is formed by tooling. Another gather of glass is made, this time a smaller one. A bubble is blown, a broad constriction is made near the blowpipe, and this will become the stem. It’s lowered carefully onto the merese, inflated, pulled upward, and trimmed free of its gathering blowpipe. Excess glass is trimmed away on the tip of the stem. Another merese is formed. 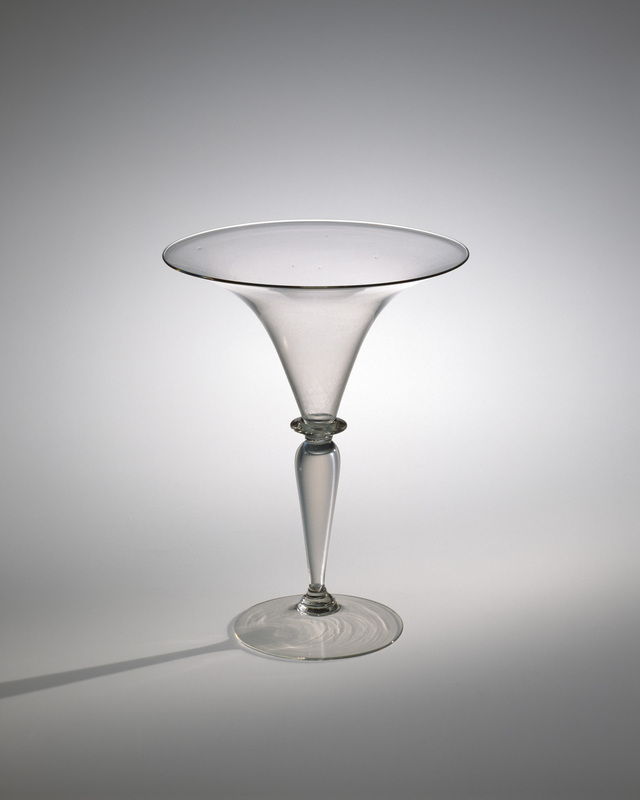 The glass is pressed upward onto the stem to ensure that the join is very strong. A third bubble of glass is lowered onto the merese. This will become the foot. Throughout the process, the entire vessel must be occasionally flashed in the furnace to make sure that all parts stay well over 1000 degrees; otherwise, they might crack. A constriction is made in the bubble, excess glass tapped off, and this will leave a hole in the end. And the hole will become the edge of the foot. The soffietta is used to cool the lowermost part of the stem. During the reheats to soften the foot, the stem unavoidably softens. The soffietta is used to reshape the foot bubble, and this will make it easier to open to its final shape. Because the glass is so thin, it must be reheated frequently. The foot is given its final shape. The site where the punty will be attached is cooled somewhat, the entire object flashed in the furnace, and the punty attached. The punty is simply a handle. The neck is broken, and the open end reheated. The end is opened to a diameter of about two inches, the glass reheated, and the soffietta used to inflate the upper shoulder. The final form of the object is created with a combination of reheating, tooling, and spinning the punty to create centripetal force to give a beautiful, exponential flare at the rim. The edge is made perfectly flat, the vessel flashed in the furnace one last time, and it’s broken free of the punty and placed in the annealing oven for gradual cooling.